Lead Story: While locally our attention has been turned towards the teachers strike, there was another story going on in the background: the 11th anniversary of the 9/11 attacks. As we put more distance between us and that horrible event in our nation’s history, the day is finally starting to resemble other such days of remembrance. (This, of course, is from the perspective from someone who didn’t live in New York, D.C. or Pennsylvania, nor lost a loved one that day; for those that did, 9/11 will always hold different meaning.) 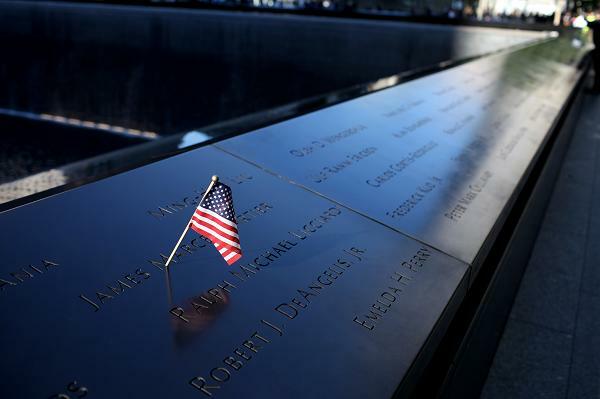 It’s a strange transition, one our nation hasn’t seen since Pearl Harbor; there were fewer 9/11 families at the memorial this year than ever before. Perhaps it’s because the 11th anniversary doesn&apos;t mark a milestone or because the death of bin Laden takes an edge off. Or maybe we’re finally moving forward, processing and learning from what happened rather than staying, immovable, in the past. But as we move on, a new wave of creepiness is setting in. For example, yesterday I received an email about a “Patriot Day” promotion from FTD. After I shared this on social media, friends brought up similar examples of crass commercialism trying to profit from tragedy: a casino offering a $9.11 voucher or the noted practice of “tragicrafting.” There is still a learning curve to creating the historical context of this day — but there&apos;s a line that shouldn&apos;t be crossed. While there are Veterans Day sales, there aren’t any special Pearl Harbor Day mattress deals that I know of. NBC learned this lesson the hard way yesterday: The network was heavily criticized for cutting away from the officially observed moment of silence to interview Kris Jenner (aka Kim Kardashian’s mother) about her new breast implants. So onward we stumble, fumbling around how we move forward and, to borrow the cloying phrase so often attached to the day, never forgetting. Also: The Drew Peterson saga just got weirder. Peterson has fired the one attorney who fought hardest against the defense team decision that probably got him convicted. D-Pete attorney Steve Greenberg tried to convince lead attorney Joel Brodsky not to call Kathleen Savio’s former divorce attorney as a witness. But Brodsky did so anyway, even after the judge warned him it was a bad idea; then in testimony, Savio&apos;s former attorney made the explosive claim that Peterson’s now-missing fourth wife asked whether she could get more money in a divorce if she threatened to reveal Peterson’s alleged role in Savio’s death. So, to review: Drew Peterson fired the one attorney who seemed to know what he was doing. Because of course he did. And then: With the rash of mass shootings this year (including local mass shootings that don’t make the national media), one from two years ago made headlines yesterday: Amy Bishop, the University of Alabama-Huntsville professor charged with killing three colleagues and wounding three others during a faculty meeting in 2010, surprised many by pleading guilty to the charges. The speculation is that Bishop was angered by being denied tenure in 2009. Alabama state law requires a presentation of evidence to a jury even in the event of a guilty plea, so there will be an abbreviated trial later this month. While capital murder carries the possibility of the death penalty in Alabama, Bishop’s plea deal means she won’t face it whenever she’s sentenced. Recovering: Jerry “The King” Lawler, pro-wrestling legend and commentator, following a heart attack he suffered during a live episode of the WWE’s weekly RAW show. A fellow commentator had to reassure viewers that Lawler’s heart attack wasn’t part of the show. After receiving treatment at the arena, Lawler was taken to a nearby hospital where he’s in stable condition. For non-wrestling fans, Lawler is probably best known for his part in the bizarre “feud” he had with comedian Andy Kaufman, all of which was a typical Kaufman ruse; Lawler even portrayed himself in the Kaufman biopic Man On The Moon. It was a tragic, violent day for Americans overseas. Christopher Stevens, the U.S. ambassador to Libya, and two other State Department officials were killed at the U.S. consulate there. Meanwhile, protesters in Cairo stormed the U.S. embassy in Egypt. Someone has finally taken a “do it for the children!” approach to legalizing marijuana. A new report says conditions on Mars probably didn’t support microbial life as scientists once previously thought. It’s finally here: Apple will apparently introduce the latest version of the iPhone today. But unless it has a built-in flux capacitor, I don’t want to hear about it. I, for one, welcome our new skunk overlords. New census stats will likely show the nation has its highest poverty rate since 1965. A prisoner shot and injured by Elgin Police during an escape attempt has filed a $6 million lawsuit against the EPD. Erineo “Eddie” Carranza, the man who owns the much-maligned Congress Theater, is the new owner of the beloved Portage Theater, prompting our own Jim DeRogatis to wonder exactly what Carranza has up his sleeve. Get excited, Smashing Pumpkins fans. Billy Corgan’s new teahouse opens this Friday. Sox Watch: The Tigers gained back the game they lost Monday night, beating the Sox 5-3 and cutting the Pale Hose lead in the AL Central back to two games. Michael Jordan may have finally relinquished control of personnel decisions over the struggling Charlotte Bobcats. The Blackhawks have signed defenseman Michael Rozsival to a contract, assuming there’s even a season. Hope for the North Side? Here’s a nice profile on Cubs prospect Jorge Soler. Even Derrick Rose is weighing in on the teachers strike but still no word from the Bulls about those Kevin Love trade murmurs. Korean popstar Psy – like LMFAO without the layer of suzzy ick – is in the States for some appearances following his mega-ultra-super viral hit “Gangnam Style.” And, thus, let the brilliant mash-ups begin.